DAF XF105 Space Cab 6x4. The DAF XF105 is deceptively simple in appearance, almost car-like in operation and yet highly complex under the skin. The XF105 is big news for DAF, the slab-sided highway hero has been a massive seller in Europe for years and the best-selling heavy-duty truck in the United Kingdom last year. The 13-litre MX engine has gained an enviable reputation for reliability and, when backed by the ZF AS Tronic transmission, has made many friends, both behind the wheel and back in the office. 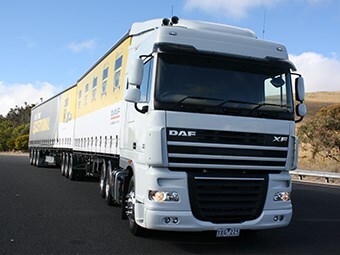 But out here in Oz, the DAF range has to date, apart from some earlier pre-Paccar forays, been concentrated on the lighter end of the GCM scale, carving out a place for themselves as a supplier of premium spec rigid trucks and single trailer prime movers. The Australian trucking environment is a unique and fickle one, not just because of extremes in temperature or high gross weights. But as challenging as our environment may be, it makes it an excellent place to test the limits of driveline components. To be fair, Paccar did just that, running the wheels off the XF over a two-year period in a variety of applications. 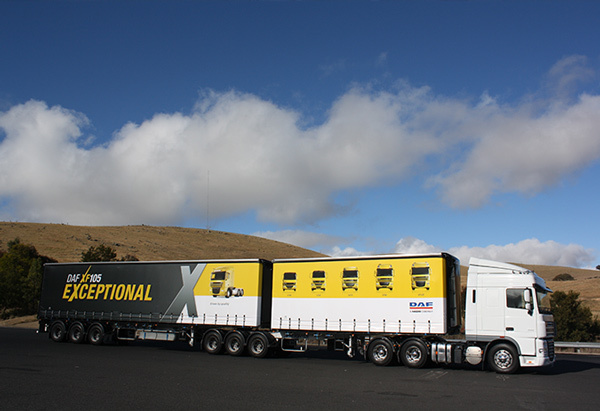 The end result was the official release of the XF105 at the Melbourne International Truck, Trailer & Equipment Show (ITTES) in March. 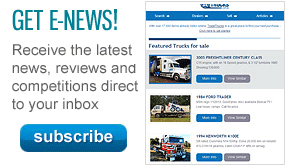 The towering Super Space Cab stole the show but the cabover is also available as the slightly lower-roofed Space Cab. 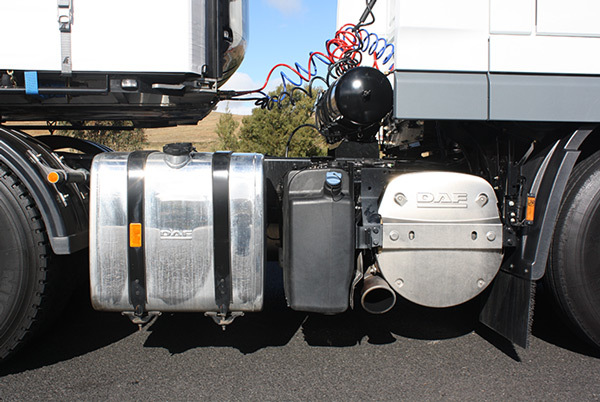 Typically the long distance B-double market is dominated by 15-litre engines. The Aussie tendency to ‘over spec’ our vehicles ‘just in case’ has, with the possible exception of Volvo, kept it that way. But the eternal pursuit of fuel savings in an industry that runs on razor thin profit margins is starting to make the 13-litre engine look more attractive, especially in some high-cube applications. With competing 13-litre offerings covering the 331-397kW (450-540hp) range, Paccar’s MX 375 (the 375 refers to kilowatts) selective catalytic reduction (SCR) engine occupies the popular middle ground at 510hp. The MX also provides 2,501Nm (1,845 ft-lb) of torque with maximum torque available from 1,000rpm to 1,410rpm. 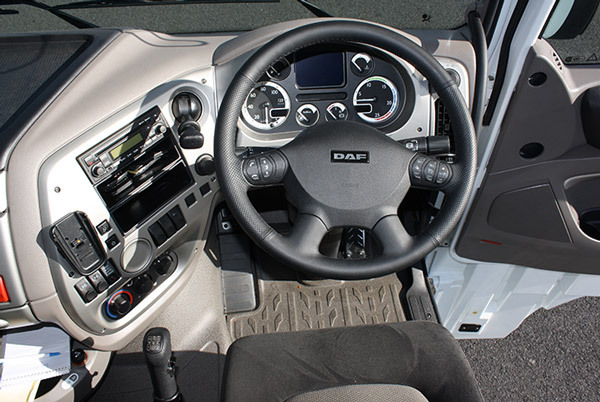 While the 16-speed ZF AS Tronic AMT transmission is likely to be the most popular choice by far, DAF is also offering a manual version and, surprisingly, the manual on offer is Eaton’s venerable 18-speed Road Ranger rather than a synchromesh ZF manual. The logic behind using the twin countershaft stick shift is simple. 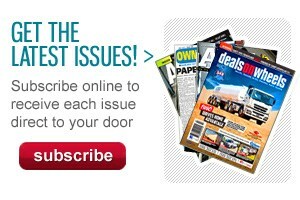 The Eaton box is relatively cheap to service, maintain and rebuild and the parts are readily available Australia-wide. But another factor that comes into play is that these days most Aussie drivers simply aren’t used to synchro boxes in heavy-duty vehicles. Modern prime movers now tend to have either a self-shifting transmission or the good old-fashioned Eaton gear stick. This means the muscle memory and gear changing habits developed over decades behind the wheel can be readily transferred to a manual XF105. Whereas the consequences of double clutching, or not using the clutch at all on a synchromesh gearbox can be disastrous. Even a habit as simple as not depressing the clutch all the way to the floor will take its toll on a synchromesh clutch and transmission. Funnily enough it’s the cab that earns brownie points from me. Okay it’s hardly striking, even a bit bland to look at, but the room available in the Space Cab (1,750mm of headroom) let alone the Super Space Cab (a massive 2,100mm) is first-class. There’s plenty of nooks, crannies and cupboards for a driver’s gear, and then some. Under the bunk lies a slide out fridge as well as a dry storage area. The external locker boxes are also accessible from inside the cab, although they are a bit small for my liking, especially compared with some of the competition. The cab is fitted with double bunks; the folding upper berth can also double as storage, with a cargo net of its own. 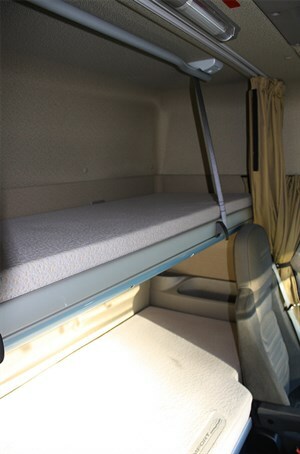 The top bunk is raised or lowered by using a belt-mounted crossbar. To my mind, the crossbar would make a great towel rack after a road side shower, there’s even a fold down ladder to access the bunk. The plethora of slide out trays, rubber-topped storage surfaces and cubby holes are great, there’s even a thermos/bottle holder in the driver’s door. But, unfortunately, the only cup holder really worth using is actually in the top of the slide out fridge. The basic dashboard may not be to everyone’s taste but, from a styling and functionality point of view, everything was easy to see and easy to operate. I recently slid behind the wheel of a Road Ranger-equipped XF105 for a drive down the Hume Highway from Sydney to Melbourne. With a B-double set behind the prime mover, it was a chance to get up close and personal with Paccar’s indigenous MX engine, and check out the creature comforts and highway manners of one of Europe’s most popular highway trucks. With the rumble of a Sydney morning peak hour drifting in the window from the nearby M4 motorway, I climbed aboard the towering prime mover and familiarised myself with my surroundings. To be honest, the gear stick seemed out of place in the slickly styled confines of the XF’s interior. Sort of like finding a dial on the face of your iPhone, it does seem to represent a collision of engineering philosophies. Rolling out into the traffic, the rev characteristics of the MX engine took a bit of getting used to. The engine built up revs quickly and quietly, meaning I had to keep a watchful eye on the tacho to get a feel for the engine and to make sure I didn’t make a dog’s breakfast of gear changes. The second set of traffic lights I encountered highlighted one issue: the absence of a trailer brake hand piece. While the AS Tronic-equipped XF has a hill start function, the Eaton-equipped version, for obvious reasons, doesn’t. This can make for some fancy footwork when trying to idle away uphill from a standing start at a gross weight of 56 tonnes. I found it difficult to pull away smoothly without scaring the pants off the poor motorists sitting behind me. I don’t think it’s a stretch to say that most drivers would find this an issue. The MX itself seemed to reward slow gearshifts low in the rev range to get moving, making the most of the 13-litre engine’s 1,000-1,450rpm torque range. But once the wheels were turning at speed smooth effortless changes were easy from 1,500-1,700rpm. The gear stick itself is actually the same shifter that is used in the manual ZF version in Europe. While I’m sure most drivers would adapt, the splitter button was confusing to operate, and I found I had to keep glancing at the side-mounted rocker-type switch to see whether I was in high or low. It lacked the intuitive feel that drivers operating an Eaton box would be used to, although the front-mounted range change switch was easy enough and pretty self-explanatory. My point about the splitter was proved in spectacular fashion when climbing Skyline heading towards Mittagong. The engine lugged right down to 1,200rpm easily, so I thought I’d change down a whole gear and lug the engine right down before the next change. Unfortunately, I’d inadvertently flicked the splitter button into the ‘up’ position rather than ‘down’. By the time I realised my error, I’d lost a lot of road speed and I had to pick up top gear in bottom box to get back into the climb. My companion from Paccar, Mark Lenko, took it all in his stride over in the passenger seat as I muttered a few choice words, cursing the transport gods for good effect. Despite these criticisms, the shift itself is fantastic. Little effort is needed to move the stick which has been positioned nicely within reach of the driver but out of the way of everything else, providing a light easy to use gear shift. The MX engine boasts a compact graphite iron (CGI) engine block and cylinder head. While weight savings and strength are the primary objectives of CGI, a pleasant side effect is the quiet operation of the engine due to the lower resonance of the high density CGI materials. In short, it’s very quiet on the road, even when it’s working hard. Performance-wise, the 13-litre MX delivers as advertised. The easy-to-work-with torque band low down in the rev range combined with the tall gearing (the tacho needle rests on 1,450rpm at 100km/h) add to the distinctive Euro flavour of the DAF’s driveability. Sure it’s no fire breathing, asphalt churning monster, but it pulled two trailers at 56-tonne gross happily enough, only really working up a sweat on some of the longer steeper grades. The tall driveline meant road speed tended to drop fairly quickly before the engine knuckled down and worked. The XF rewarded an early change out of overdrive when the road started to climb. But, as mentioned earlier, there are plenty of B-double applications that cube out well before maximum legal weights are reached. While most of the Hume has now been duplicated, there are still plenty of spots that will test the cab suspension out. And cab suspension on the DAF is fantastic. The long travel of the front springs on the steer axle plus the torsion bar and coil over shock cab springs make sure that no jarring or bounce reaches the driver. But for such a big cab it’s the lack of lateral sway that impresses, with the rear of the cab also featuring lateral struts as well as airbags. It’s a great system that works well. Paccar’s eight-bag rear suspension also helps in the road holding and stability stakes. 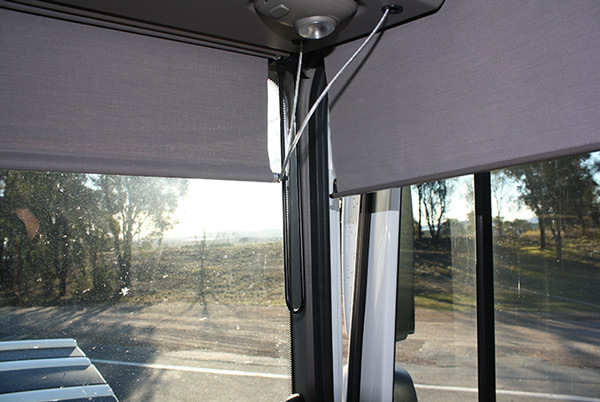 As the sun descended I was able to use the XF105’s roller blinds, both front and side, to keep the sun out of my eyes. As darkness fell I flicked the lights on and noticed virtually all sources of illumination were concentrated around the instrument cluster and there was no reflection bouncing off windscreens or windows. It was also handy not to have a glowing stereo face just above eye level as daylight fled and rain moved in. The big DAF won’t be everyone’s cup of tea; it may not have the right numbers on the door, or even look the part. But it’s easy to overlook these factors when you steer one for any length of time on the road. It’s a very easy, pleasant vehicle to operate. But, what may grab some attention are the fuel figures for the drive, 1.97 km/l, pretty impressive for a truck with only 7,000km on the clock lugging a gross weight of 56 tonnes. Of course there’s diesel exhaust fluid (DEF) or AdBlue to take into account but even allowing for a 4 percent of diesel burnt average that’s still pretty competitive B-double trucking. Given the performance and refinement of the AS Tronic transmission, it’s a fair bet that there probably won’t be many manual versions of the XF105 built. But the Eaton transmission and the MX engine do still make for a harmonious partnership albeit one that requires just a couple of tweaks.